Recently, we at FUJIFILM VisualSonics reached a milestone in our history with the installation of the first Vevo® MD Ultra High Frequency (UHF) clinical ultrasound system at the Second University of Naples in Italy. According to Dr. Roberto Grassi, Professor of Radiology at the F. Magrassi and A. Lanzara Department at the Second University of Naples, this new technology brings the team’s capabilities to a whole new level and shows great potential for developing novel applications in the clinical sector. Goody bag contains bluetooth speaker, mug, notepad and of course our mascot mouse. Do you have an experience using our Vevo® technology that you'd like to share in our globally distributed newsletter? 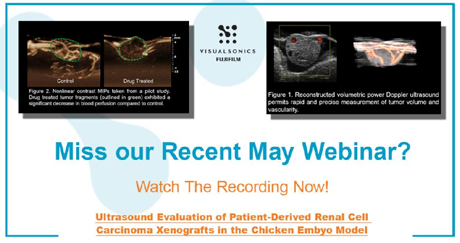 In this issue, we are asking you to tell us how our Ultra High Frequency Ultrasound or Photoacoustic System has advanced your research. If your story is shared, you will receive a FUJIFILM VisualSonics bag of branded goodies! Rabbit embryo in a murine dam??! A very amusing image of what looks like a rabbit embryo in a murine dam. Image courtesy of Dr. Gilles Renaud from Cochin Institute in Paris, France. Attention all Vevo 3100 customers: Please update your system with the latest software update. Login to the customer site to download the package which includes all relevant documentation, plus a technical bulletin. As always, no existing data will be altered during the update, and previously licensed features will continue to be available. This issue's Tip has been shared by Application Specialist Lindsey. Transverse Aortic Constriction (TAC) is a widely used experimental model to create pressure-induced cardiac hypertrophy and ultimately heart failure. The Vevo UHF System can be used to assess the success of surgery to quantify blood flow velocity at the constriction site. Question is, which transducer should you choose to measure TAC velocity? Dr. Hon Leong and Matthew Lowerison from Western University presented interesting evaluations of anti-angiogenic treatment responsiveness. 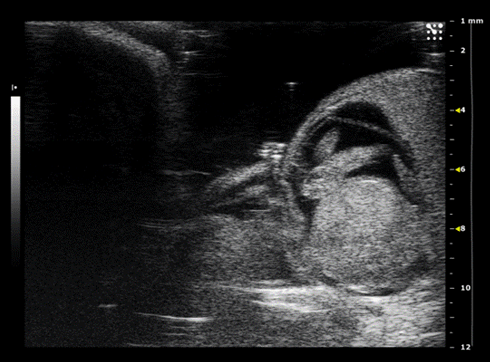 Patient derived tumors were engrafted into a chick embryo model and imaged using ultra high frequency ultrasound. If you missed the live webinar, here's your chance to catch up! Yes She Can! 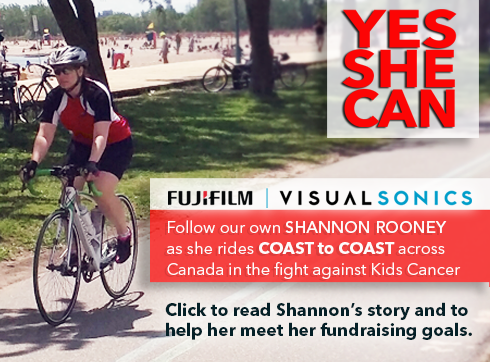 Our Own Shannon Rooney takes on Canada from Coast to Coast! Shannon Rooney is the Human Factors Specialist at our Toronto office at FUJIFILM VisualSonics. This September, she will ride 2800 km across Canada from Vancouver all the way to Halifax over 18 days to raise money to fight kids' cancer. We will be sharing her journey on our social media channels. Find out what inspires Shannon to make this journey and how you can contribute to her success.